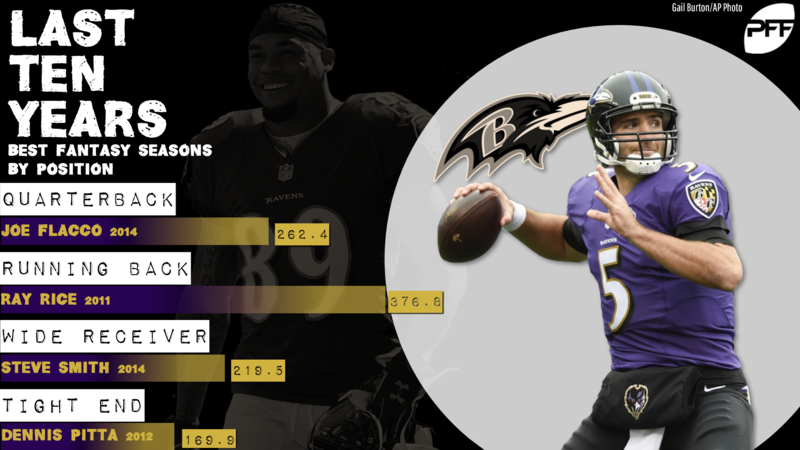 The Ravens’ last decade started as well as just about any team’s. They made the playoffs every year from 2009 to 2012 (actually stretching back to 2008), culminating in a Super Bowl title in 2012 over coach John Harbaugh’s brother Jim’s 49ers. Since then, things have cooled — the Ravens have missed the playoffs in four of the last six years. One of the exceptions, though, was last year, a year of transition for the Ravens with Lamar Jackson taking over at quarterback and the team riding the run-heaviest offense in the game to a late playoff run and a first-round loss at the hands of the Chargers. Over the course of the decade, the Ravens have gone 93-67, with only one losing record (a 5-11 finish in 2015). But the team also hasn’t won more than 10 games since 2011, even going only 10-6 in their Super Bowl title year. Still, with a new quarterback and a new and wholly unique game plan in the modern game, the Ravens of 2019 bear little resemblance to the team Baltimore has put out over the last 10 years. Let’s take a look at the best Ravens fantasy seasons of the last decade. Before Week 11 of 2018, Flacco has started 145 of 153 games for the Ravens over the last decade. He missed six games in 2015, with Jimmy Clausen, Ryan Mallett, and Matt Schaub each starting two in Flacco’s absence. As such, logically, Flacco has the top nine and nine of the top-10 Ravens QB seasons in our timeframe, with Clausen’s 27 points in 2015 the best non-Flacco season before 2018. Of course, Jackson took over for Flacco in Week 11 of last year, and from that point to the end of the year, he put up 141.0 fantasy points. That’s a 322-point pace over 16 games, so while Flacco’s 2014 leads the way in raw total, Jackson’s pace dwarfed that of Flacco. If Jackson in 2019 can be anything like he was in 2018, this leaderboard will change in a hurry. In the conversation of “running backs burn fast and bright,” we have Rice. He was a backup in 2008, then took over the starting job in 2009 and went RB3, RB4, RB1, RB4 over the next four years, totaling 5,066 rushing yards, 2,440 receiving yards, and 39 touchdowns over that span. Then in 2013, his numbers tanked. His PFF grade fell almost 20 points from the year before (73.7 to 54.6), his yards per carry dropped from 4.4 to 3.1, his total yardage fell from 1,621 to 981, his touchdowns fell from 10 to 4. His career ended after that largely for off-the-field reasons, but for better or worse, if he had been better on the field in 2013, his career likely would have continued. Smith’s career second act in Baltimore didn’t reach the heights of his first in Carolina, but then it really couldn’t have. He played 13 years with the Panthers and had more yards than his career-best in Baltimore six different times. Smith’s second year with the Ravens, in 2015, was supposed to lead into retirement, but a torn Achilles convinced him to come back for one final, underwhelming 2016. But in 2014, it was close to vintage Smith, with a thousand-yard season, 6 touchdowns, and 133 targets that were close to a career high. Pitta has the top two Ravens TE seasons over the last decade, with 2012 and later 2016 coming within a point of one another. (Depending on your scoring system, you might actually find 2016 higher in some places.) In between those years, he played a total of seven games across three seasons, suffered two hip dislocations, and was told my doctors he shouldn’t even continue his NFL career. He did so anyway in 2016, leading all tight ends in receptions that year, but dislocated his hip again that offseason and called it a career. In other words, in the guy’s last two full seasons, he was a top-10 tight end, but his body wouldn’t let him do much beyond that. He’s one of the really sad and frustrating injury cases of recent vintage.